HARMAN is dedicated to bringing remarkable sound to people everywhere – from the car and the office to the home and everywhere in between. That’s why we were proud to sponsor and deliver superior sound and lighting to “Music’s Biggest Night”– the 60th GRAMMY® Awards! While iconic artists often gather in Los Angeles for the celebration, HARMAN was excited to see the sixth decade of the GRAMMYs taking the stage in the Big Apple. In addition to supporting the GRAMMYs, HARMAN has a long track record of elevating audio experiences for many prestigious establishments across Manhattan, including Yankee Stadium, Madison Square Garden and Radio City Music Hall. HARMAN powered several programs throughout the star-studded weekend, including an influencer marketing campaign with Best Buy, and an exclusive influencer viewing party sponsored by JBL at The Skylark. 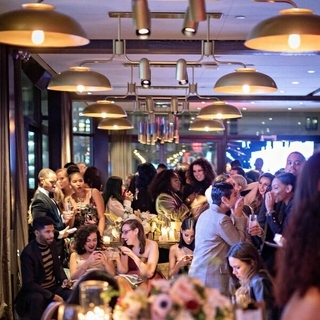 DJ’d by DJ Wonder and Shishi, the son of HARMAN President and Chief Executive Officer Dinesh Paliwal, the viewing party featured a compelling high/low concept to mimic the unofficial celebratory dining experience that is fitting for award winners at the end of their night. Additionally, Dinesh walked the red carpet at the Clive Davis Pre-Grammy Gala alongside HARMAN’s newest brand ambassador, Priyanka Chopra. The award winning actress, producer and philanthropist joins a diverse roster of brand ambassadors from music, sports and entertainment, including American multi-platinum performing artist Demi Lovato; prolific musician, producer and humanitarian Quincy Jones; Indian music mogul Dr. A. R. Rahman, world-renowned pianist, educator and philanthropist Lang Lang; 2015-16 NBA Kia Most Valuable Player Stephen Curry; NBA All-Star and musician Damian Lillard; as well as soccer star Jerome Boateng, among others. Whether “Music’s Biggest Night” is in New York or Los Angeles, HARMAN is proud to be associated with the Recording Academy and salutes the best in music excellence. Visit GRAMMY.com for news from throughout the weekend and Sunday night’s show.